Almost 40 years ago, Lt. Col. Richard Cummings purchased “Indian” from Antonio Diego (referred to the biography written by Joy Gibson) at the Ramstein AFB in Germany. Receiving memories on how Diego collectors purchased Diego’s works of art adds to the history of Diego Voci and becomes a part of the Diego Voci Legacy. #MASTER OF #SURREAL STRIKES AGAIN! Who owns this painting now? Last known collector of this work of art created by Diego Voci (1920-1985 VOH-chee), was in 1974 purchased by Col. Malloy in Ramstein AFB in Germany. Last information we have on this painting, is from 1976 when it was purchased at Ramstein AFB by Vincent Mazzarino. Who owns this painting now? Where is it located? Any information on this Diego Voci (Artist of a Thousand Faces) gem of an artwork. Where is “Playing Children” now? This is an old faded polaroid of Diego Voci’s “Playing Children“. Last information the Diego Voci Project Team has of the whereabouts is that Major Thomas Loken purchased this painting in 1976 at Ramstein AFB in Germany. Where is this painting? Diego Voci, an artist of a thousand faces! Contact us at www.diegovociproject.com with any information on this painting. Human beings are drawn to emotions in a form of expression that Diego did so well in his portrayal of people on canvas. Diego empathized with people of lesser means and told their stories with his brushes. No holding back, Diego captured the raw human face in his works to share the beauty of all walks of life. 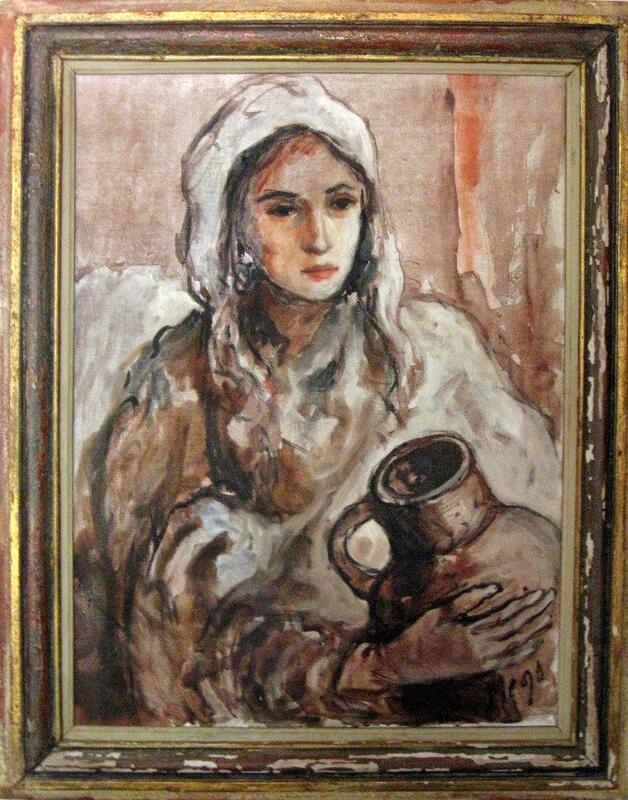 The Silvers Family of Colorado shares their “Girl with Pitcher” with the Diego Voci Team, a painting completed during the Joy (Gibson) Naffouj time period. Joy Naffouj in conversation with Diego one day said “Everyone knows you as Diego… you need to be signing your paintings Diego”. That was the beginning of the Diego Voci Legacy (1965).